Here they come...from the Planet Zero! The incredible workers of the Future! "Moving across the landscape, overrunning all obstacles as inexorably as the Future itself, these amazing, efficient and powerful automatons have but one purpose - to serve their masters at work and play!" This was the sales pitch for Zeroids, released in 1967. The initial release featured four different robots: Zerak, Zobor, and Zintar could be bought separately or packaged with either a Solar Cycle or in an Action Set. These three Zeroids came packaged in plastic containers which became a vehicle or mini-playset for use by the robot. The fourth Zeroid, Zogg (the Commander-in-Chief) could initially be bought in an Action Set only (he could later be found carded or boxed. In 1970, Ideal added the Alien Zeroid with Exploding Chest. At this time Ideal changed packaging to a header card format (the new packaging featured updated "hip" graphics and colors, and many more could be shipped in a smaller case), and offered the accessories as separate boxed items: the Sensor Station and the Zeroid Missile Defense Pad. The Zem XXI Zeroid Explorer Module was also added as an accompanying vehicle to the Zeroid line. Shortly after this (probably when sales began to flag), Ideal marketed the separate Zeroids simply as "Robots" in small, white window boxes or as "Zerak Robots" (these were found in Kreske's department stores). At some point, Zogg was offered in the same boxed format as the original three robots (with the addition of the Lazer). Towards the end to the line, Ideal kit-bashed the three robots to produce the Zemo robot, now found in Red or Turquoise (the rarest of the Zeroids and not part of their initial development). "Each Zeroid has a unique pair of special purpose hands, interchangeable magnetic and throwing hands, and a battery-powered motor with forward and reverse drive. In operation, Zeroids are capable of grabbing, pinching, carrying, clawing, attracting, throwing, pushing, pulling or hauling functions." From "turret to track" each Zeroid simulates a marvelous mechanic-electronic complex, molded in awesome detail, and the sparkling Zeroid packages double as functional play units!" At some point, Ideal released Zogg in his own tall-case packaging. This figure is perhaps the rarest of the Zeroid packaging variations (Zemo is usually found in the "Zeroid with w/Solar Cycle" packaging or in one of the plain "Robots" or "Zerak" boxes). "Turn him on" while he's still in his control station package and lookout! His brute strength unhinges the transparent plastic cover which drops to provide an exit ramp for Zerak. Employs unique hooks for hands plus magnetic and throwing hands. A kindly carrier with special duty gripper claws. Like magic, his empty plastic package becomes a roomy Cosmobile for hauling loads. Also has magnetic and throwing hands. The back portion of this Zeroid's package becomes a dramatic lunar sled that seems to carry gripper fisted Zintar over the terrain. With magnetic and throwing hands. Zintar was originally molded in gray plastic, which at some point was changed to a metallic silver (with metallic flecks) - the silver version appears to be the rarer of the two. Contains Boxed or Carded Zeroids as a case of figures (no further details available on counts or totals). The Zeroid Alien was release towards the end of the line, and bears little resemblence to the original Zeroid (only the basic size/shape and treads/motor are similar). Slightly larger than the typical Zeroids, the Alien had rubberized arms that would fly off when programmed to explode. Nylon disks could be inserted into the torso to program the Alien to move in patterns and explode when necessary. An extraterrestial treadmill that converts the track power of the included Zeroid into a rolling energy of its own while imparting a curious pendulum-like action to the Zeroid. Complete with extra Zeroid hands, Laser Bomb and Reversing Ramp. Contains One Zeroid who can run up the ramp of the included Missile Defense Pad and automatically trigger the sequential firing of 3 harmless rockets before reversing his drive and backing off the ramp. Complete with Solar Cycle and Reversing Ramp. Contains the only Zeroid with the power-supplying Dyno Grids necessary to energize the included "radar" Sensor Station and the signal blaring Sonic Alarm. Also included is the "galactic go-cart" known as the Solar Cycle. Zogg, with awesome power, is the Commander-in-Chief of all Zeroids! He dominates the terrain of Planet Zero in his new rolling Solar Cycle. He can also propel himself to the Sensor Station or Sonic Alarm where, with his unique Dyno-Arms he, and only he, can activate the Space Scanner, Radar Antenna, Hypno-Scope and Audible Alert. Turn a switch and Zogg lights up like a computer complex. Whenever danger threatens and a warning signal must be given, Commander Zogg can be directed to this sparkling structure. He rolls up on the platform with his Dyno-Arms extended forward and touches the contact plates of the Sonic Alarm. Power from Zogg's batteries frow thru his Dyno Arms, energizing the Alarm which emits a loud, insistent sound. An interrupter-button is provided for coded signalling. Only Zogg can activate the Sonic Alarm. This appears to have been exclusive to the Zeroid Commander Action Set. Any "turned on" Zeroid can make this galactic go-cart roll over "moon dust and crater bumps" with ease. It's a terrestial treadmill that transforms the track power and weight of a Zeroid into rolling energy of its own, while imparting a curious pendulum-like action to the Zeroid. The Solar Cycle would come packaged with a Zeroid, or as part of either the Zeroid Commander Action Set or Zeroid Action Set. The eyes and ears of the Zeroid Complex! The ever-watchful Commander Zogg rolls up on the Sensor Station platform with his energy-supplying Dyno-Arms extended. When he touches the contact plates on the Scope, the long-range Radar and Power Antenna rotate, searching the horizon 360 degrees, while the whirling symbol in the Hypno-Scope spins its data to the attentive Zogg. Only Commander Zogg can activate the Sensor Station. Demonstrates the retaliatory capabilities of the peace loving Zeroids. When the need arizes, any Zeroid moving up the pad ramp will automatically trigger the sequential firing of 3 harmless rockets, and then auromatically back down off the ramp. 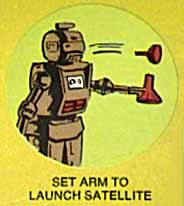 Missiles may also be launched manually and selectively. This purple and chartreuse saucer exemplified toys from the late 60's/early 70's. A child would fly his Zeroid around the room enclosed in it, then place the vehicle on the floor for landing. Landing gear would drop, and with a flip of a lever, the hatch would swing open dropping a platform. A pin from the floor of the Zem XXI activated the Zeroid which would decend the ramp all the while a "doinking" spring sounds. The box reads: "Platform Rotates...Landing Pads Automatically Lower...Ramp Drops...Zeroid Moves Out." Also, "With Automatic Action...For Use With All Zeroids...Weird Vibra-Sounds." and the obligatory "Zeroids Not Included...No Batteries Required." When discussing Zeroids, two other Ideal toy lines come to mind: Star Team roll-playing sets (which include gear for the intrepid 10 year old space explorer), and the subsequent Star Team figure sets of the 70's. In 1977 Ideal re-released Star Team (which was originally a set of roll-playing-type accessories meant to be worn by a child, released in 1969), probably to capitalize on the then successful Star Wars figure release. The Star Team featured a rehash of Zem XXI (now called the Star Hawk) along with a reworked Zogg, now called simply "Zeroid." Zogg lost his head (replaced by a dome), his arms became all plastic (no metal insert to transfer power), and his motor became a memory. "Zeroid" was released individually boxed in a silver and blue version, or with the Star Hawk flying saucer in a silver and red version. The red Zeroid, called (gulp!) "Red Zeroid" in the Comic (see below) is identified as the "Pilot/Gunner." The blue version of the Star Team Zeroid robot, this one came packaged in a windowed box. "Highly detailed action robot with moveable arms. Zeroid rolls on a twin tread base. Flip on his special flashing signal lamp and send messages to his friends." This zeroid, called "Zeroid Red" in the comic (see below), is identified as the "Engineer/Mechanic." A red flying saucer with a flat conical dome, the Star Team spaceship would open via a sliding door to reveal the red Zeroid. "The Star Team spaceship with motorized hatch & space-like sounds. Complete with Zeroid, Moveable landing pods, Revolving platform, Exit ramp, and Clear Dome." A new figure designed from the Action Boy mold with added panels and circuits, Zem 21 borrows its name from the ZEM XXI Zeroid Explorer Module from late in the original Zeroid line. This chrome bodied humanoid had robotic features and a bright green plastic head. "Metal plated humanoid robot. The ZEM-21 can be posed in hundreds of different positions. Create exciting action scenes with ZEM-21 and the other Star Team figures." The villain from the Star Team line, the Knight of Darkness was basically Ideal's version of Darth Vader, on a Captain Action body moulded in black plastic. Due to the exchangability of body parts, many Captain Action collectors seek this figure to replace broken or missing Captain Action pieces. Because of this, the Knight of Darkness is the most expensive toy of the Star Team line. "The fearsome enemy of Zeroid and ZEM-21. The Knight of Darkness is a fully poseable figure and comes dressed in a special uniform and boots. Over 11" tall." At some point Ideal decided that Zem-21 and the gang needed the "humanoid touch" so they invited Kent to the party. It is the year 3000. For the first time, Earth's solar system faces invasion! From out of the mysterious Black Nebula which swirles in the intersteller vastness beyond Pluto have come the Knight of Darkness and his Shadow Warriors to establish a foothold amid the outer planets of the solar system. Here, they have been held at bay but the Knight's drive fro conquest is unending. To keep him in check requires I. And this dangerous vigil is the job of Earth's Star Team Scouts, such as Zem-21 and his two Zeroid companions, the heroic crew of the saucer-ship Star Hawk! This game is basically a rehash of "Battling Tops" where each side tries to knock out the other side's tops as mock battles. This progresses around the "galaxy" (the edges of the board like Monopoly). Whomever reaches the end first wins. "The action game where you move around the board and battle in the Space Arena for control of the Universe"